I enjoy portraits even though I'm still learning so much about oil painting. 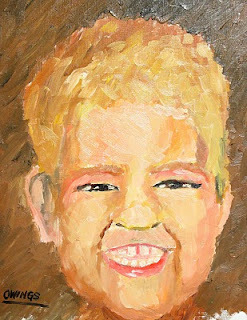 This is a painting of my son Ethan. He did not sit for this portrait...he's 5 years old. Getting him to sit still for the photo was enough of a challenge. He has so much energy it amazes me. The specific techniques involved in this piece are an underpainting of opposite colors. For instance this is a warm toned painting so the underpainting is done in cool colors, blues & blue grays. As I've begun to learn oil painting, one of the secrets is not trying to do too much. This essentially means that you block in the light and dark areas, add some contrasting tone and see where your at. If you overwork the paint and try to do too much, it just all becomes flat and lifeless looking. Also, paints make a difference and cheap paints tend to look cheap & dull. For this painting I used Holbein which is a very nice, buttery smooth paint produced in Japan. Oil paints take a long time to dry, 6 months to a year. You can speed that process by mixing in additives (drying agents) or thinning it with turpentine as I do when I'm painting plein air (outside) and I need to work quickly. To control oil paint you have to master certain techniques, unless you paint like Jackson Pollock in which case you set yourself free so to speak. This painting of Ethan took me just a few hours because I didn't try to re-work it or concentrate on every little detail, which I tend to do more when I'm drawing. The thing I've started to learn about oils is that they work best when you don't try to bully them into what you think they should do. Sounds strange, but if you just apply some basic principles and process you end up with a better finished work than if you tried to focus on getting every detail correct. The right balance of light and dark can make all the difference. I draw because I can control the pencil and pen very precisely. I use pastel and oil paint because they force me to be less controlling and more thoughtful about how the process is working. I don't even touch watercolors because they're like the rebellious teenager of art mediums. I've been at it part-time for about 5 years now and although I've gotten somewhat better at it, my disappointment is that I'm not better by now. I'm already in my mid 40's so I don't have a lifetime to master all the skills. I've settled on the fact that if I can improve incrementally, hopefully I can build on that. I really enjoyed reading about your use of oil paint, especially the part where you have cool undertones for a warm painting. Ethan looks awesome, and it's great that you could do that in just a few hours. I love how your paintings look like paint. It sounds funny, but I am such a tight acrylic painter, that when I finish, it looks more like a bad photo. But, the learning process is so much fun, I still love it. Thanks for these daily postings. They make me feel inspired to do more. Thanks so much for the comments Jayne. I saw your work on Etsy and what I saw did not look like a bad photo at all. You managed to capture a lot of really excellent detail in the dog and the girl. I actually thought it showed a lot of promise. If you want to stay more precise...and I know this sounds crazy...loosening up with the paint will help you get there. I know that sounds kind of crazy, but it works in the long run of the whole process. Let me explain this a little. For instance if you can loosen up your brush work and paint more in lights and darks rather than details, eventually it helps make the details more realistic as you refine the technique. Each day I'll try to leave a post that has some tips in it. I'm a long way from being an expert, but I really believe in sharing what I know with other artists and learning from them as well. Oh, wow, I just saw that you replied to me. I look forward to your tips. My problem has always been that I am too tight, I have been trying to loosen up for years. I think that the daily art project could help me loosen up, because I will be in a hurry many days, I'm sure.